Some people claim that Angel Beats was perfection. Those people are completely wrong. THIS is perfection. Okay first of all, it's an OVA, so it won't have any real story. So the main question is, Did it follow the rules of the universe. Answer- yes. Yurippe would go to the ends of the earth to try to unbalance the Afterlife, and these plans are no less extravagant than the ones seen in the original series. OVA 2 did have a twist that surprised me immensely though, will say that. So it's Angel Beats. It's got good animation, with great character models, great scenery, great action sequences (for the ones with them), great everything. Once again, it's Angel Beats. Let's move on. If this were the original series, I definitely wouldn't have given this a perfect score. But this is an OVA, so the question is, Did anyone go OOC. And the answer is no, everyone remained within perfectly believable behavior. So that's a 10/10 too. The real decider- did I enjoy this masterpiece. Yes. So, for OVA's, my general policy is to turn of my brain, especially if it's from a funny show like Angel Beats. So did it make me laugh, did I want to see more, did I feel nostalgic about the ending. YES. So 10/10 as well. If you're looking for character development and deep, intriguing plot, you won't find it here. It's an OVA, so the real matter is whether it served its job, and it did. Perfect score (probably the only one I will ever give). These two OVA's are part of the story and includes Yuri's attempts to have Kanade summon God. It goes back to the beginning of the series where they are still fighting Kanade. Yuri devises two plans for the SSS to act in such ridiculous manners that Kanade won't be able to handle it and therefore would need to summon God for assistance. They are both entertaining in their own right. They are both on the more comical side of the series rather than the dramatic side. The comedy itself is pretty entertaining but I personally found it a bit too chaotic and too much to handle. The beginning of the series was the hardest to get through for me so watching two extra episodes from the beginning wasn't that enjoyable to me. The series does well at making it a comedy-drama but I prefer the drama over the comedy of this series. If you enjoy watching these characters act ridiculous then by all means, these OVA's should be entertaining to you. 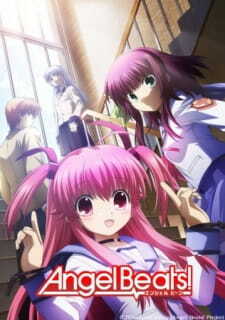 Angel Beats was a great anime in my opinion and was both funny and emotional at times. What we do understand is that the "front line" has been doing these missions against Angel for a long time. Although since the series is so short we don't see many of these missions that they would pursue. These specials show us more missions that the front line attempts to do to get Angel to call for God. I'm glad that these specials were exactly what they are. They are good for some laughs, and I am glad they did not try to make these episodes emotional. If they tried that I'm sure that it may have ruined the series. These fun episodes give us insight on how they have been living their life for so long in this afterlife world. The art is beautiful, just like it was in the original. The art style of Angel Beats is what I'd consider the HD Anime style, the characters looked great, the scenes looked great the intensity gauge in the first episode looked great, theres nothing bad about it! Perfect. To start off the characters all fit their roles perfectly. The sounds effects sound perfect. Additionally the first episode of this special deserves bonus points for the intensity that the voice actors must have projected their voice. Next we have the intro and outro music. Its the same as it was in the original. Personally, I thought this music described the series perfectly and, the intro specifically is one of my favorite songs to date. As I said in sound the characters voice actor's play their parts perfectly, making these specials funny and fun to watch. If I was in their position, I could see me becoming one of them and having fun/ doing anything to try and 'beat' Angel. I had a lot of fun watching these episodes. I would include these specials in a rewatch with friends for sure. It may not be what you want to watch directly after finishing the season if you are still crying from the last episodes, but if you liked Angel Beats and you thought it was a funny series like I did, you will enjoy these specials for sure. Story: These OVAs perfectly fit into the story of Angel Beats, not doing anything story-breaking, out of character or overly fanservice based in the series to take away from it's natural charm. 10/10. Art: The art stayed at the great quality held by Angel Beats. 9/10. Sound: The soundtrack was also great, and it fit all of the fun shenanigans that we got to watch happen with all of our favourite characters. 9/10. Character: The characters even managed to have some development in these OVAs, it was enjoyable to see more school-life based events, with their own Angel Beats styled twists, whilst getting away from some of the more serious themes after finishing the show. 10/10. Enjoyment: I absolutely loved these, and think that Stairway to Heaven, may very well be one of my favourite standalone episodes of an anime, ever. 10/10. Overall: I think that these OVAs were outstanding and should definitely have been part of the actual series, which should have been made longer. 10/10, no question.